LaserJet 4200/4300/4250/4350 printer 13 paper jam error | 49 firmware error | 50 fuser error | 51.1 beam detect error | 52 laser scanner error | 57 fan failure | 59 main motor rotation error code repair/service! LaserJet 4250/4350 numerical error code repairs as well as 4200/4300 printer maintenance service error code repairs! We specialize on HP LaserJet 4200/4300/4250/4350 printer repair with numerical error code failures. LaserJet 4200 series 4300, 4250 and 4350 printer error code failure indicates the part has failed during a printer usage. Most common 4200/4300 and 4250/4350 series printer error code failures are 13 paper jam, 49 firmware error, 50 fuser error, 51 beam detect error, 52 laser scanner failure, 57 fan failure, 59 main motor rotation error, Our technicians have the knowledge and technical ability to solve HP LaserJet printer service error codes and numerical error messages on the first visit. We provide HP LaserJet 4200/4300, 4250/4350 printer error code repair with 13.1 paper delay jam in the tray, 13.2 paper stopped jam at paper feed area, error code 13.5 and 13.6 paper delay jam at Fuser, 13.10 paper delay jam at paper reversing area or Paper jam at Duplexer, 13.20 paper stopped jam in the paper path, 13.21 Paper delay jam at top, 41.3 unexpected paper size, 41.5 paper reached a sensor too early. We specialize on HP LaserJet 4200/4300, 4250/4350 printer error code 57.3 replace the fan 2, HP LaserJet 4300 only error 57.4 replace fan 1, HP LaserJet 4200, 4300, 4250, 4350 printer error code 57.7 The cooling fan in the optional duplexer is bad, replace the duplexer fan. Most HP 4200/4300, 4250/4350 printer control panel error messages are what they mean on printer service error codes. Our Authorized HP printer technicians provide fast on-site printer service with image defects, vertical lines, horizontal lines, repeating dots and error code failures. HP LaserJet printer repair/service with numerical error code failures in Southern California! LaserJet printer error code repairs in Orange County, Los Angeles, Orange County and San Bernardino, Ca! HP Color LaserJet printer error code repair/service in Southern California! HP Color LaserJet printer service error code repairs in Los Angeles and Orange County! HP Color LaserJet MFP error code repair Southern California! HP LaserJet MFP and Color LaserJet MFP service error code repair! LaserJet 4200/4300 and 4240/4250/4350 service error code repairs! We fix Hewlett Packard LaserJet printer service error code failures! LaserJet printer error 13.02, 13.05, 13.20, 13.21 Paper jams in the top cover area. Laser-Jet 4200, 4300, 4250, 4350 error 57.3 replace the fan 2. LaserJet printer error 69.X optional duplexer is not functioning. LaserJet printer error 79.XXXX printer detected a critical hardware error. HP LaserJet Printer Maintenance - Clearing the HP printer maintenance count and service messages! 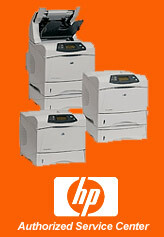 We replace original HP LaserJet printer maintenance kits and clear printer maintenance service message! If the display panel on your HP LaserJet printer reads "PERFORM PRINTER MAINTENANCE" your HP LaserJet printer needs a maintenance kit, which includes a fuser unit and separation rollers. The maintenance kit message will only go away if you reset or clear the maintenance count. Once you reach 200,000 pages on HP LaserJet 4000/4050 and 4200 printers the error message appears and you need to reset the maintenance count to zero to make the message go away. Clearing the Maintenance Count error message on HP LaserJet 8000/8100! 1. Enter service mode first. 3. Press the Select button to enter the settings into the printer's memory (an asterisk will appear next to the zeros). NOTE: Some versions of the 4000, 4050, 4100, and 5000 will NOT have their maintenance count reset by following the preceding "short cut" method. This is due to the many different formatter board revisions. If the short cut method doesn't reset the maintenance count then you will need to go service mode to manually reset the maintenance count to zero. How to Reset the maintenance count on HP LaserJet 4100mfp/4101mfp, 4200/4300, 4250/4350 and HP 9000/9040 and 9050! (Note: on LaserJet's 4200, 4300, 9000 you can hold down the checkmark button as you turn the power on and then wait for the three LEDs to illuminate. On LaserJet's 4250, 4350 series you need to wait until you turn the power on and the memory starts counting before you hold the checkmark button. A message New Maintenance will appear in the control panel display and the printer will reset. HP LaserJet Printer service error code repairs in L.A and OC! All rights Reserved Laser Printer Services ©1991-2016 - Laser Printer Services Logo, this website and its contents, are property of Laser Printer Services. All images and logos used with permission from the respective owners. No part of this site, or its source code, may be reproduced in any way.